Mushroom Model Publications has been doing these types of books now for a few short years, yet each edition seems to get a bit better than the first. If you are new to these books, they basically combine a history of the aircraft, a difference in various subtypes, a walkaround of the aircraft (usually from preserved planes or warbirds) and a superb selection of profiles. This one is no different. The title should actually say J-M Lightning as the very late war P-38M night fighter is included in the book. Why concentrate on only the J-M versions and not the earlier ones? Well it seems to me that perhaps there was just too much material for one book. It also seems that with only one known example of the early war Lightning flying, that there wouldn't be sufficient aircraft around for the walkaround photo feature. Anyway, the book does start with the usual historical background on the P-38 and then goes into the differences between the variants. This includes information on the recce P-38s. Each one includes artwork so that the reader can tell the difference between subtypes when the difference between them is external. There then follows a section on P-38 aces with a chart of victories. There is also a goodly number of photos of the various men in front of their planes so you can see the nose artwork. Next there are 48 pages of close-ups and general photos both of warbirds, museum planes, period photos and tech manual drawings of the P-38J-M. While I'd take any colors shown on museum or warbird photos with some skepticism, the photos are well done and very useful to modelers wanting that little bit extra in terms of info for their models. Finally , there are 26 pages of profiles. Actually, many of the planes are shown in two view with a closeup of the cockpit nacelle and an overhead of the entire aircraft to show wing markings. Overall, another excellent reference book and one that is perfect for the modeler. 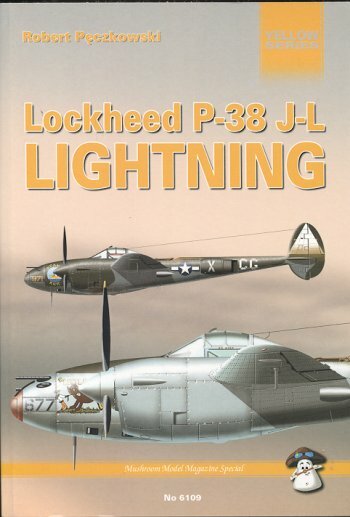 If your interest is in the P-38, then this is a book that should be on your shelves. Review book courtesy of Mushroom Models Publications.